The Formentera Council has announced the activities programme for this year's holiday season, a full lineup with something for everyone from children and teens to families. It all but promises a one of a kind holiday season studded in yuletide charm. Things get rolling Friday November 30 with the kickoff of the 2018-2019 Christmas market. With vendors and stall tenders once again setting up next to Sant Francesc's plaça de la Constitució, the Mercat Nadalenc (or Mercat de Nadal) is equal parts Christmas-time hangout spot and gift-idea bonanza. Live music and activities specially tuned for youngsters are scheduled through January 7. This year's Christmas activities programme budget was €35,000. On Saturday December 29 and again January 18, 19 and 21 the island plays host to the twelfth Mostra d'Espectacles Infantils, an eclectic array of programming designed to spice up the Christmas holidays for Formentera's youngest. The programme begins with Tatanka, a family-friendly show in which Minúcia Teatre use the language of clowns to recount Suli and Monyaco's adventures in a world vastly different from the one they know. The all-ages production, an experience in American Indian culture and civilisation, begins at 6.00pm on Saturday December 29 in the cinema (Sala de Cultura). The Mostra picks up again at 6.00pm on Friday January 18 with Xènia Fuertes's Engrunes musicals, a music-filled production for children ages zero to three at Sala de Cultura. On Saturday January 19, the Zum-Zum company presents Formentera audiences with La gallina dels ous d'or. This tale of poverty, wealth and greed, in which the key lesson is that riches are but romantic tales, starts at Sala de Cultura at 6.00pm. The final act—storytime at Biblioteca Marià Villangómez—happens Monday January 21. On Thursday December 13 the library will also be the scene of a workshop in which children four and up will cut out literary snippets and use them to make a Christmas tree. On Friday December 14, the small plaza in Sant Ferran's carrer Guillem de Montgrí will welcome one event in particular—a performance of Christmas carols, or nadales—that has quite rapidly become a local sensation. This year's Cantada de Nadales features the pupils of el Pilar de la Mola, Mestre Lluís Andreu and Sant Ferran de ses Roques primary schools as well as the municipal band. Hot chocolate will follow, with options for those with gluten and lactose intolerances. Then it's the return of another Christmas mainstay, Diverespai. From December 15 to 19 and mornings 9.30am to 1.30pm and afternoons from 4.00pm to 8.00pm, young ones can take part in an assortment of activities. On Saturday December 3, youth from Formentera's drop-in centre, the Casal de Joves, is staging a batucada—an African-flavoured Brasilian drum session—and a demonstration of street dance at the Christmas market. The Casal is putting together a string of other activities this Christmas, where participants can craft their own Christmas decorations, enjoy hot cocoa, or take in a documentary. Wednesday December 12 at Biblioteca Marià Villangómez, Maite Ferrer will host a discussion of Lluís Ferrer and Juan Escandell's book Història d'Eivissa i Formentera. For theatre fiends, Baal will fuse dance and interactive tech in Travelling, is Thursday and Friday (December 13 and 14). December 15 is unquestionably a heavy-hitter of the 2018 holiday programme, with performances in the Sant Ferran festival tent by Ramon Mirabet and Projecte Mut. Ramon Mirabet, a native of Sant Feliu de Llobregat, will get the night started with a freshly energetic take on his normal shows. Expect some of the new songs to turn up on Mirabet's forthcoming third album. Ibiza outfit Projecte Mut will shut the party down with a mix of material from recent release “La Vida Rima” and old crowd favourites. David Serra and Joan Barbé's collaboration finds the singer-songwriter and musician-producer pair exploring the depths of folk-rock as they pivot from original lyrics to texts penned by some of the finest poets of the Països Catalans. December 15 at 4.00pm, the students of the Verge Miraculosa school will stage a Christmas nativity scene in the cinema (Sala de Cultura). Then, December 20, the children of the island have a visit from old Saint Nick to look forward to. Santa Claus will be at the Sant Ferran holiday tent from 5.30pm, the hot chocolate comes later. Of course, hometown culture and traditions are essential, too. In that spirit, the local gastronomy enthusiasts of Es Forn are inviting moonlighting chefs to a clinic on a local favourite—salsa de Nadal—in jardí de ses Eres at 11.00am. Plus, for Wednesday December 26, a day recognised locally as Sant Esteve Day, the “Three Kings' association” is doing its part to revive another homespun tradition: the Mitjana Festa de Nadal, or “Half Christmas”. Caroling, traditional dance and a concert at the Christmas market. The evening of December 29, the Kings will be in Sant Ferran to celebrate nine years as an association with an evening of dance, barbecue and good music at the festival tent erected for the holiday season. The entertainment programme will continue December 31 as well, Formentera's final send-off to 2018. The last night of the year (and technically one hour into January 1), Bruxa Express will ring in 2019 with a show marked by rollicking pop/rock covers. As is tradition, Thursday January 5 at 4.30pm the Three Wise Men (“the Three Kings of the Orient” as they are more commonly known here) are expected at the harbour in la Savina. From there the entire cavalcade will set out on its tour of the island, preceded on each stop by Campi Qui Pugui's performance Rats! At 5.30pm the cavalcade is awaited at Sant Francesc's plaça de la Constitució, at 7.00pm in Sant Ferran, and at 8.00pm they will make the trek up to la Mola. From December 3 to January 7, a Christmas exhibition from a group of local artists will be on display, Monday through Saturday, 11.00am to 2.00pm and 5.00 to 7.00pm. Catch the show's contributing artists at the vernissage on Monday the 3rd at 8.00pm. 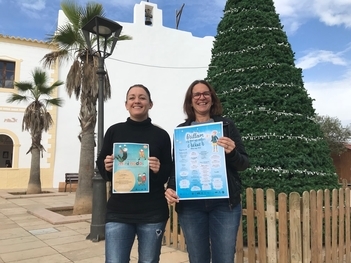 As in years past, the chamber of commerce for Eivissa and Formentera is once again pairing with the Formentera Council to organise the 11th Annual Christmas Window-dressing Contest, push to promote festive Christmas decorations at local businesses.